Ode to Mike Holmes(the Canadian professional contractor not the ice hockey player) Oh Mike, you brawny, blonde, chiseled charmer, you Adonis of abodes, you domicile dreamboat. In my fantasy, you walk through my front door in your coveralls and steel-toed boots. You look around and then pull me into your arms and tell me it's all going to be okay. Then you go to town......noticing the way the crown molding ends abruptly without the correct finishing pieces. I show you how big chunks of the bathroom tile was never grouted properly. You use words like vapor barrier, code, standards, shoddy and I think I am going to explode on the spot from the size of...the job. Then you tell me it's going to be alright, you are going to fix everything. Then you pull out your big tool......belt, and you get started. You rip out stuff and then you put it back right. You finish things the way a girl ought to have things finished. My husband and I bought our house from people who had made lovely cosmetic upgrades but either did much of the work themselves or used substandard contractors because corners were cut. Gene and I watch Holmes on Homes whenever we can and can I just say, he is everything that is right about Canada. He is a craftsman of the highest order. 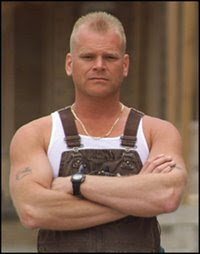 This morning while we watched the show, I cautiously told my husband that I was developing "feelings" for Mike Holmes. Me: I think I have a crush on him, is that ok? Gene: Honey, even I have a crush on Mike Holmes, it's okay. So Mike, if a google alert makes it's way to your inbox and you read this, my husband and I decided that if you were to ever make me an indecent proposal, I could heartily accept. We don't even need the million dollars, but I can accept only on the condition that you give our house a good once over. Could you possibly squeeze any more innuendoes into that lust letter? I think I need a smoke. A man like that and he fixes things. Swoon. And by "house" you mean????? Interesting. I feel the same way about Amy Matthews of the DIY Network. She could crawl on my bathroom floor any day . . .